Most political observers consider 1972 the beginning of the “modern era” of presidential politics. After the controversial 1968 presidential cycle, the Democrats began to reform their nomination process to make it more inclusive and transparent, and to make its results more representative of the will of the party as a whole, not just the party bosses and insiders. 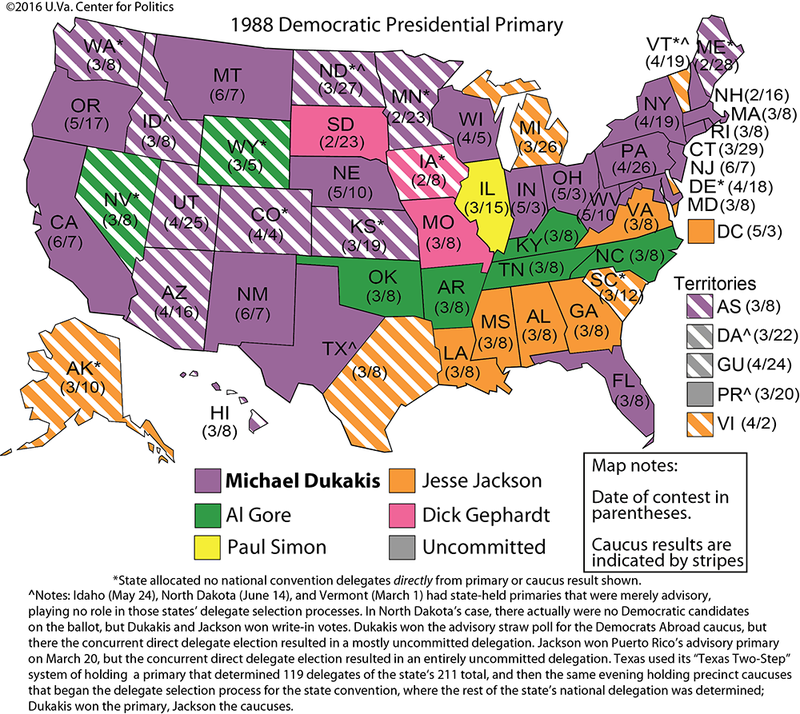 In this new age of mass politics, Democrats have had nine competitive presidential nomination battles (i.e. cycles without incumbents running or serious challenges to sitting incumbents), whereas Republicans have had seven. Two weeks ago, we laid out 1 the Republican presidential nomination contests going back to the Gerald Ford-Ronald Reagan battle in 1976, with the primary or caucus or convention results for the states and territories in each cycle. This week, we review the Democrats' history. 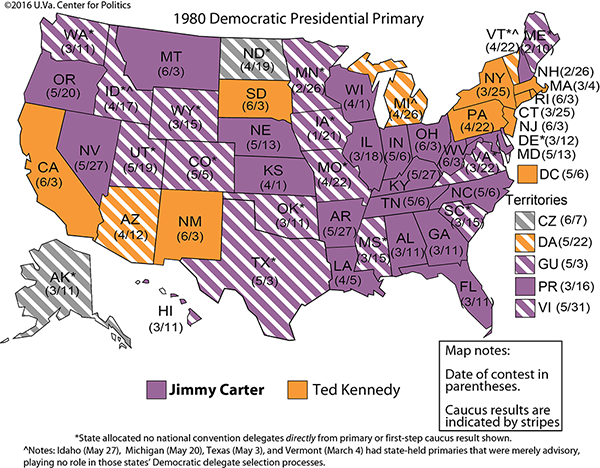 In 1968, Vice President Hubert Humphrey won the Democratic nomination without having entered a single primary. The Democratic National Convention in Chicago was the scene of mass protests and police beatings, while sharp disagreements and anger filled the air inside the convention hall. In the aftermath of that experience and the loss in November to Republican Richard Nixon, Sen. George McGovern (D-SD) chaired a commission whose purpose was to review the nomination process and to offer proposals to improve it. The commission's report set out a number of guidelines and proposals that state parties were required or encouraged to adopt to bring more small-d democracy into the process. Among these were the implementation of anti-discrimination policies to increase the representation of women and minorities in state delegations and regulations that sought to ensure voters' choices were better reflected in the eventual selection of national delegates. Amid the latter was a set of guidelines intended to create a more consistent system of proportionality in how a candidate's support translated into delegate support, i.e. a firmer system of proportional representation. 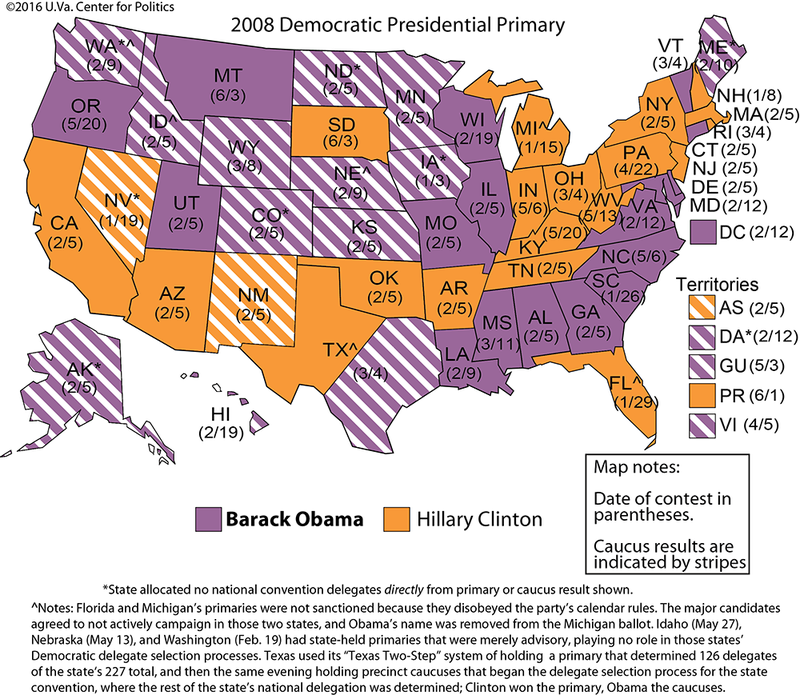 Proportionality was accompanied by the removal of the “unit rule 2,” which had enabled a majority of a state's delegates, usually under the thumb of party leaders, to control the entire vote of a state delegation even if a large minority within that delegation had a different set of preferences. While the Republican Party has a varied system 3 of delegate allocation and has been more inclined to let states choose their own adventures, so to speak, today the Democratic Party universally uses proportional representation in determining how election results translate to “pledged” delegates, i.e. the number of delegates assigned to a candidate based on vote performance. Starting in 1992, all 50 states, the District of Columbia, and six territorial delegations have used 15% as the proportional threshold. (An aside: It appears the Northern Marianas Islands will be making their first appearance at a Democratic national convention this July.) The McGovern-Fraser Commission had recommended proportionality prior to 1972, but it took some time for the 15% rule to spread to all states and other delegations. Some states were laggards in adopting proportionality, such as Illinois, which continued to use what was known as a “loophole primary,” where a state directly elected named delegates on the ballot separately from the “advisory” presidential preference vote statewide. But in the lead up to 1992, the 15% rule became standard: win at least 15% of the primary vote in a congressional district (or a smaller unit -- New Jersey, for instance, uses its state legislative districts) and a candidate is guaranteed some share of the national convention delegates assigned to that district (at least 75% of a state's base delegation has to be assigned to districts); allocation of at-large national delegates is determined by the statewide vote. Now, this proportionality works differently in Democratic primaries and caucuses. Primary systems are straight-forward, with the result broken down by district and statewide to determine allocation. 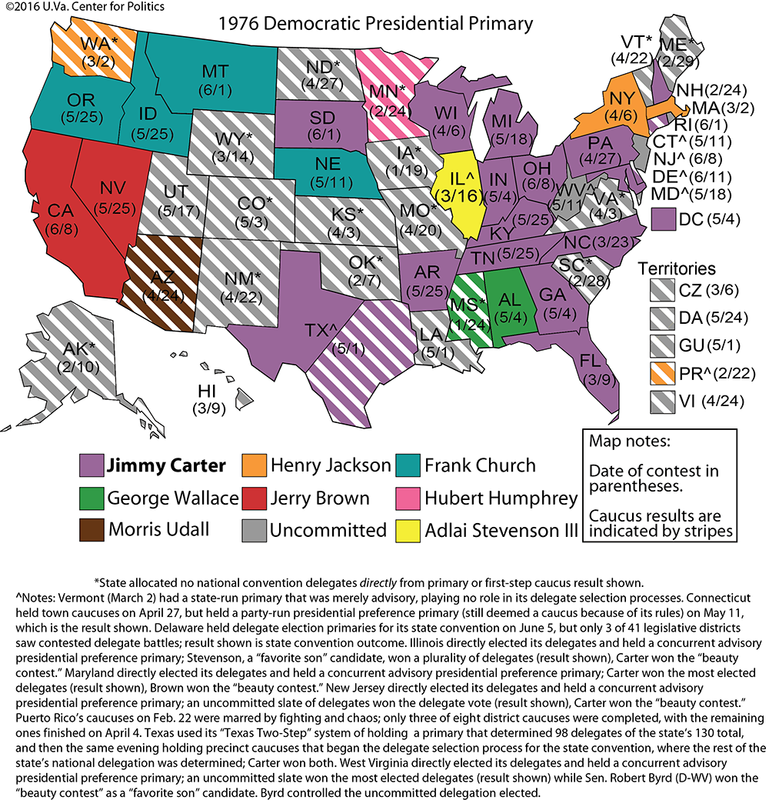 For caucus systems, there are differences depending on the state. Some, like Hawaii, use a presidential preference vote at the precinct caucus level to directly allocate pledged national delegates based on the result. Others, like Iowa, use proportionality to determine the number of delegates elected to the next phase of the national delegate selection process. In Iowa's case, precinct caucuses elect delegates to county conventions, which elect delegates to congressional district conventions (where the first actual set of national delegates are determined), and then the state convention picks at-large delegates. Still, at every step of the caucus pyramid candidates must win at least 15% support to remain eligible to win delegates, lower-level or national. In the maps below, we use an asterisk to point out contest results in caucuses (and a few primaries) where national delegates were not directly allocated by the result, though winning delegates to the next round of a caucus-convention system is obviously vital for having support further along in the process. Also worth noting is the “superdelegate” system of party leaders and elected official delegates (PLEOs) that the Democrats use to give the party's higher-ups an increased say in the nomination process. The McGovern-era reforms had greatly reduced the clout of insiders, but by the early 1980s many Democrats felt that the rule changes had gone too far in limiting the influence of party leaders. Thus a new system was implemented 4 prior to the 1984 cycle to give them more say in the outcome as, essentially, free agents who can back whichever candidate they want. At the 2016 convention, they should form about 15% of the total delegate votes. Besides differences in how they determine delegates, the two parties also have seen some strikingly different kinds of results. In the seven competitive Republican presidential cycles, the largest number of candidates to win a state's first-step caucus or primary in a given cycle was three. The Democratic experience could not be more different. Depending on how one counts the results -- for instance, we chose to focus on the election of delegates rather than advisory presidential preference primaries if a state held them concurrently -- as many as eight individuals won at least one state's first-step caucus or convention event or a primary election. This remarkable fact was largely the result of the Democratic Party's turbulent period in the 1970s, when the party's nomination reforms combined with the party's big tent (e.g. 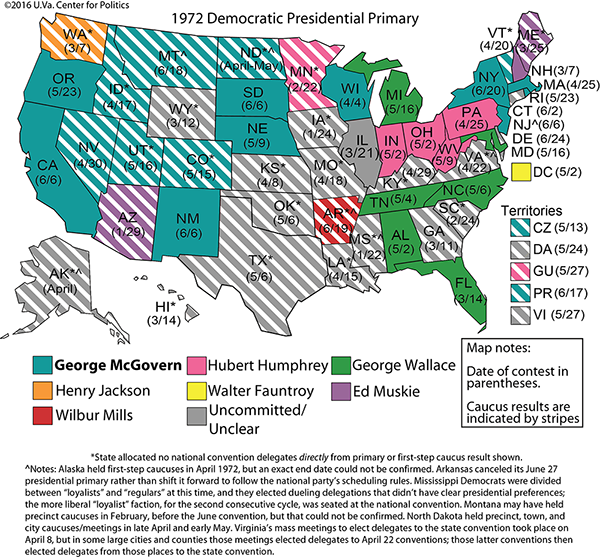 ideologically disparate George McGovern and George Wallace both ran in 1972) to produce tumult, but even in 1992 five separate candidates won contests. 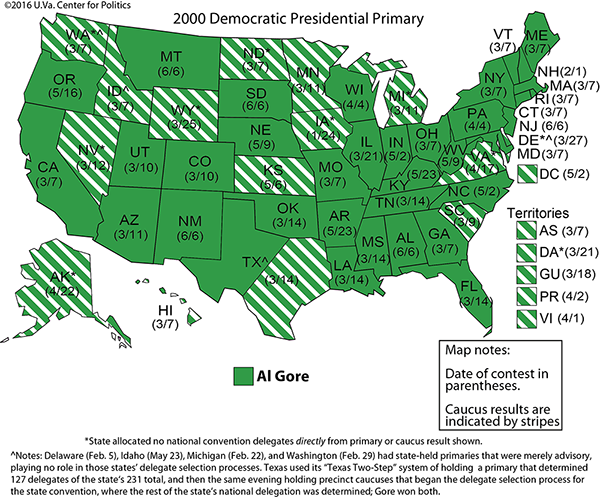 Conversely, the 2000 cycle saw Al Gore accomplish something that no non-incumbent candidate for president has done in either party: win every single state caucus or primary. 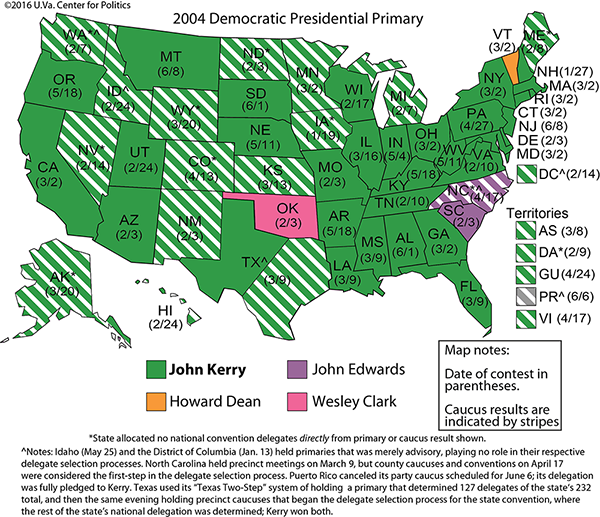 Since then, four candidates won in 2004 but John Kerry largely dominated the process, and 2008 was a face-off between Barack Obama and Hillary Clinton. The 2016 Democratic tilt will likely feature only two winners as well. Notes: *State allocated no national convention delegates directly from primary or first-step caucus result shown. 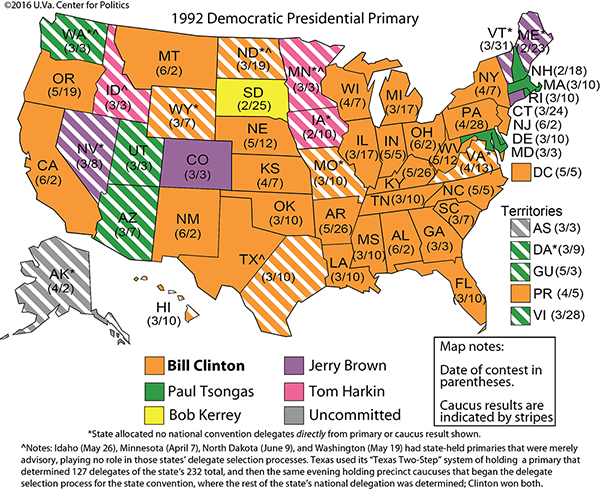 The dates of many caucuses reflect the last day of a meeting period or the day of the presidential preference vote. These events sometimes take days or weeks. In a few cycles, the maps denote that Texas used a two-step primary and caucus/convention system to determine delegates. “CZ” is the Panama Canal Zone and “DA” is Democrats Abroad. In some cases, the result shown reflects the delegate selection primary outcome in a state, not the presidential preference vote, which was sometimes purely advisory in nature.